This excellent home garden variety produces an abundance of 10-12� pale green burpless fruit with excellent flavor. 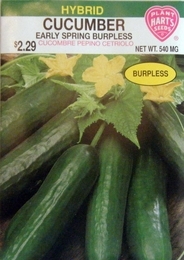 Cucumbers are crisp and biter-free. For straighter fruit and easier harvest, try growing on a fence or trellis. High fertility and plenty of moisture will stimulate growth and increase yield considerably. Seed spacing - 3-5 seeds in a ring about 3 inches across.